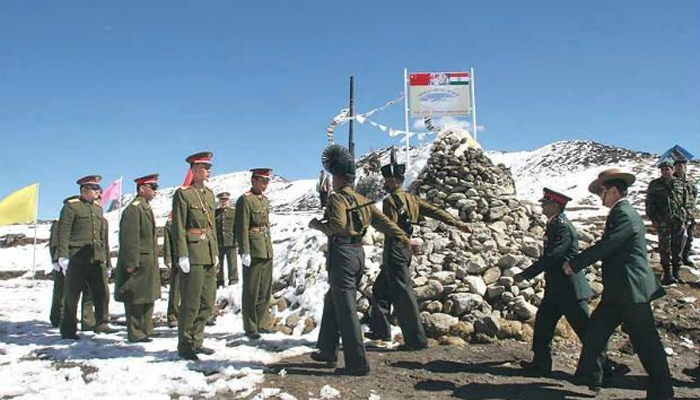 (TibetanReview.net, Nov04, 2014) – The border between Chinese ruled Tibet and India continues to remain fluid with yet another set of Chinese intrusions being reported to have taken place in the Ladakh region of Jammu and Kashmir state on Oct 22. The Chinese People’s Liberation Army (PLA) made a simultaneous incursion by sending troops into Indian waters in the Pangong Lake as well as five kms deep into Indian territory through the land route in the same area, reported India’s PTI news agency Nov 2. Timely intervention by Indian troops was reported to have ensured that the situation did not escalate into yet another drawn out face-off between the two sides. The Chinese boat-intruders were reported to have been backed by PLA troops on the road built alongside the Pangong Lake in eastern Ladakh. Alert Indo-Tibet Border Police (ITBP) troops noticed the movement of the Chinese troops and intercepted them at the imaginary line that is supposed to be the Line of Actual Control (LAC) in the lake, the report said. ITBP soldiers were also reported to have blocked Chinese troops mounted on mountain terrain vehicles from crossing the LAC by road. A banner drill – in which both sides wave banners claiming the area to be their territory – was carried out, followed by a face-off between the troops of the two sides. The Chinese troops turned back after the Indian troops neither allowed them to move their boats forward nor allowed the troops on road to move an inch further, the report added. The Chinese troops were reported to have entered up to the Finger IV area in the region and were sent back from there. The two sides had engaged in face-offs here before, as both of them claim the area as part of their territory. The simultaneous approach to enter Indian waters was seen as a move by the Chinese troops to put psychological pressure on the Indian troops who man the area, the report said. The report said Chinese patrols frequently come to the Indian side from the northern and southern banks of the lake. A 45-km stretch of the lake is Indian territory while the remaining 90-km stretch is on the Chinese ruled Tibetan side. The report said the situation along the banks of the lake has always remained volatile, with Chinese troops being intercepted by Indian Army patrols several times after the three-week long stand-off in the Depsang plains of Daulat Beg Oldie (DBO) in May last year.